Mike Zimmer and Norv Turner have a few good things going right now in Minnesota. They've got Teddy Bridgewater and Adrian Peterson on offense along with Anthony Barr and Harrison Smith on defense, all of whom are game changing players. If the wide receiving core can take a step forward in 2015, we see the Vikings contending for a playoff spot this year. There are a bunch of intriguing situations on the Vikings offense. 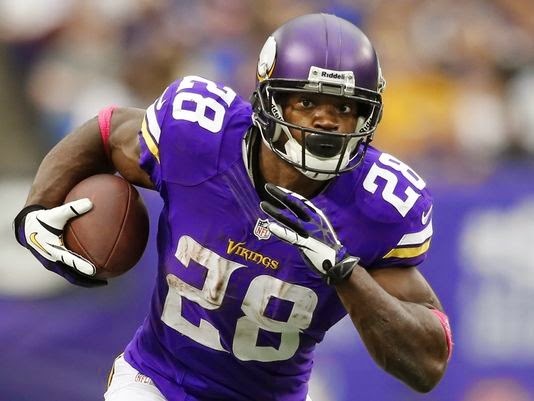 Can Peterson carry the load after a year off? Will Teddy Bridgewater continue to improve? Can Kyle Rudolph stay healthy? And will Mike Wallace and/or Charles Johnson work out as Vikings? Our thoughts are that Peterson will be very good, Bridgewater will play fin, Rudolph will finish the season after missing a few weeks midseason , and Johnson will be a top 25 WR while Wallace has an OK year. The Vikings defensive overhaul of 2014 worked well as the unit finished 14th in yards allowed and 11th in points allowed. Veterans Jared Allen, Letroy Guion, and Kevin Williams were replaced by Sharrif Floyd, Linval Joseph, Everson Griffen, Brian Robison and now in the 2015 offseason, the team brought in Terence Newman and drafted Trae Waynes to help in the secondary. For IDP, look to Griffen and Harrison Smith to produce some top numbers at their respective positions.